Isca village, 15kms outside Monze, was set up by HHI some few years ago to help settle and feed elderly people and families of disabled people. Readers of past news will know that a well has been dug, simple houses built, and tomatoes, cabbages and bananas have been planted. Recently chickens have been added to their resources. Now Isca village needs two cows and a cowshed. This will give much needed milk and nourishment for the folk. Please will you make this part of your Harvest celebrations this year. 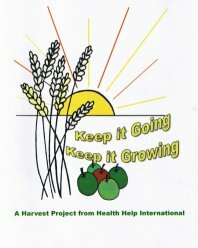 As usual, to help you we have prepared a Harvest Pack consisting of a Workbook for your children with puzzles and activities; a harvest booklet; and a Powerpoint presentation. These are all free of charge. Just request as many copies as you would like.